Propeller Brewing Company is continuing the One Hit Wonder - Limited Release Series with a seasonal classic Propeller Spring Bock- Available April 2nd. Propeller Brewing Company is proud to offer this limited release Spring Bock beer. Hand-crafted in the traditional European style, this golden lager is smooth and malty with above average alcohol to celebrate the arrival of spring. 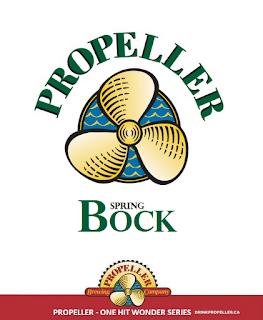 Propeller Spring Bock is brewed with carefully selected malts and is delicately balanced with Hallertauer hops. The result is a smooth, well balanced bock beer that is full of flavour.